"Define a family of algorithms [Classes that inherits from the same Abstract/Interface], encapsulate each one, and make them interchangeable. Strategy lets the algorithm vary independently from clients that use it"
The intend of this DP is to separate specific algorithms (Strategies) from the classes that require them, so the algorithms can vary independently and even at runtime. by size, by price, by color etc'. And we want to be able to add more order algorithms as time goes i.e. by country, by age etc. Internally CarPool contains a field of Strategy type (the Abstract Class/Interface) as a placeholder for the ConcreteStrategy object externally configured (injected) by the client. When the client calls the CarPool Order() method, CarPoolforwards the request to the injected ConcreteStrategy. "A Composition [CarPool Class] maintains a reference to a Compositor [OrderByColor, OrderBySize] object. Whenever a Composition reformats its text, it forwards this responsibility to its Compositor object. The client of Composition specifies which Compositor should be used by installing the Compositor it desires into the Composition." "When an abstraction can have one of several possible implementations, the usual way to accommodate them is to use inheritance. An abstract class defines the interface to the abstraction, and concrete subclasses implement it in different ways. But this approach isn't always flexible enough. Inheritance binds an implementation to the abstraction permanently, which makes it difficult to modify, extend, and reuse abstractions and implementations independently"
The intends of the Bridge DP is to enable programmers switching different concrete business logic implementors at runtime, without using inheritance. "...[using inheritance] makes client code platform-dependent. Whenever a client creates a window, it instantiates a concrete class that has a specific implementation. 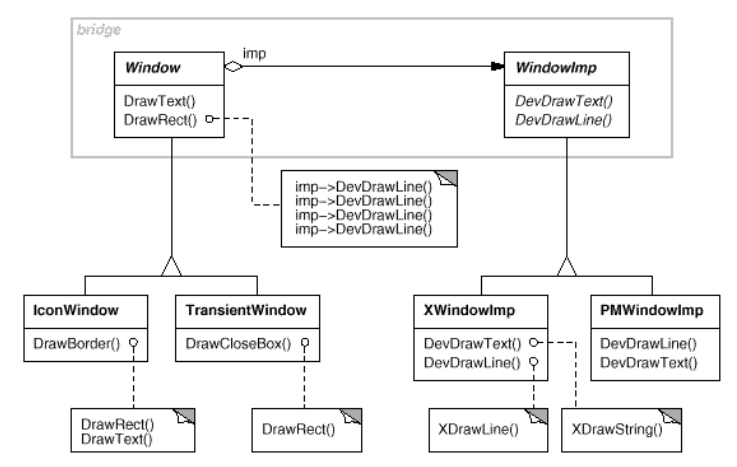 For example, creating an XWindow object binds the Window abstraction to the X Window implementation, which makes the client code dependent on the X Window implementation. This, in turn, makes it harder to port the client code to other platforms." That means that an additional important goal is to completely hide the concrete implementation from the final client. This is a crucial Hot Spot that we should remind, don't worry I will explain why later in this article. Instead of binding concrete implementors to their abstractions (Abstract Classes) we can create two separate class hierarchies (like Abstract Factory & Factory Method), one for the abstraction interfaces (the interfaces that are exposed to the final clients) and another one for the various concrete implementations, that are known only to the concrete abstractions and not to the final DP clients. "All operations on Window subclasses are implemented in terms of abstract operations from the WindowImp interface. This decouples the window abstractions from the various platform-specific implementations. We refer to the relationship between Window and WindowImp as a bridge, because it bridges the abstraction and its implementation, letting them vary independently." // NOTE: The client interacts only with the Abstractions objects. // Internals concrete implementations are not exposed to the client. // NOTE: The implementor IS NOT injected externally from the client!! The first Hot Spot I want to highlight is that when the GoF mention the various possible implementation of the Bridge pattern they don't mention an implementation where the concrete implementation is injected from the client like in Strategy DP, on the contrary, as explained before, one of the goals of this DP is to hide form the clients the instantiation of any concrete implementation class in order to be able to "...port the client code to other platforms". // NOTE: The implementation is injected by the client !! The second noticeable difference is that the Strategy pattern, obviously, doesn't consist of two separate classes hierarchies as the Bridge DP does. After reading this post I hope that the highlighted Hot Spots emphasize the big differences between these two Design Patterns and their correct implementation.